I have friends who just can’t bear to eat Pasta – reason: it’s bland! Hubby is not big on pasta either unless it’s seasoned and flavoured well. I tried this last week and he was pleased.This is for all my friends out there who hate pasta, try this and I’m sure you will be having second thoughts about Pasta. Bring a large pot of water to boil.Salt generously and add the pasta. Cook for 13 minutes (less if you like a bite to it). While the pasta is cooking; heat a pan with olive oil. Add the chopped onions and sauté till translucent. Stir in the marinara, cumin powder, black and red beans, corn and hot sauce. Stir and bring to a simmering boil on medium heat. Stir in ¼ cup Water to make a sauce consistency. Simmer 2 minutes and turn off. Once the pasta is done, drain and toss with the sauce. Season with salt as required. Just before serving, sprinkle the grated parmesan and chopped cilantro on the spaghetti. 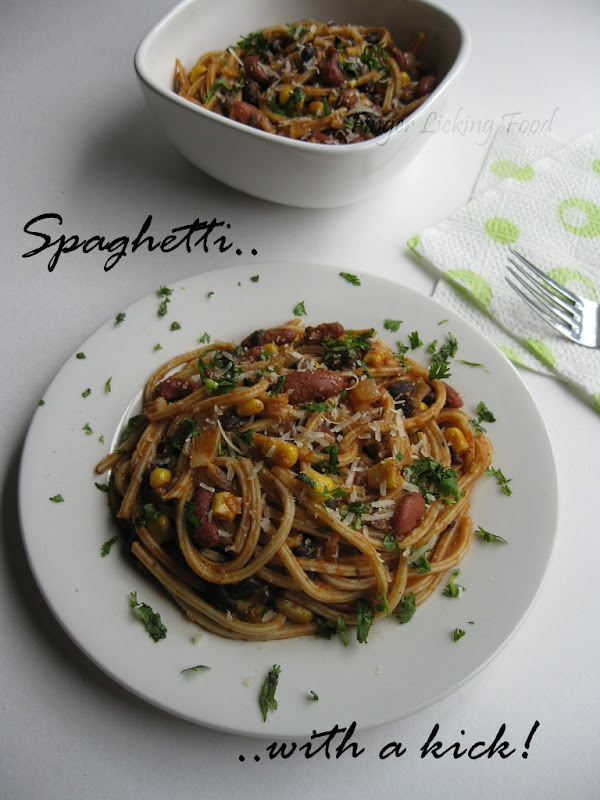 I was pleasantly surprised how well the flavours came together and made the pasta almost ‘Indianized’ if I may say so. The corn cuts the heat from the cumin and hot sauce. Its definitely a party in your mouth! I indianize my pasta so much the only thing left to put in it is curry patta :) I love this pasta, it will be my fall/winter to go recipe :) such pretty pictures too. Cumin in Pasta sounds yum! 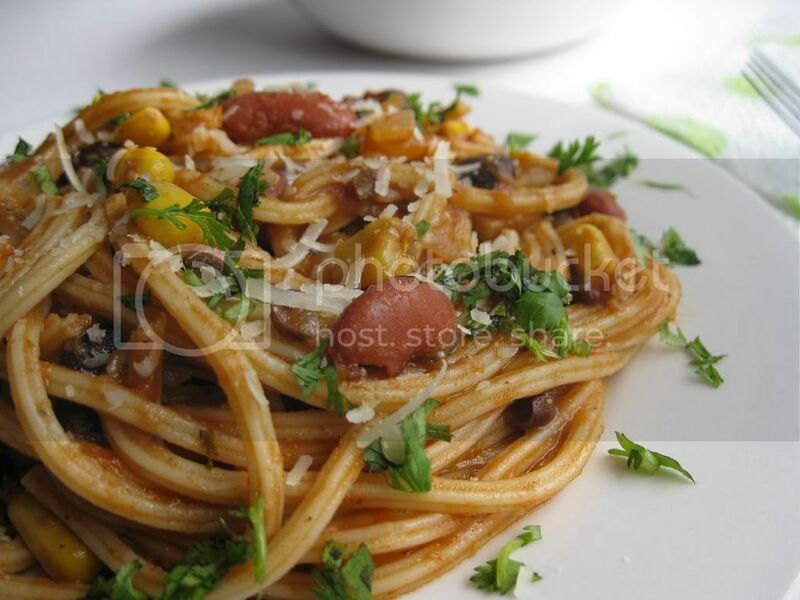 Hubby is a big fan of pasta...That plate full of pasta looks yummy..
Looks delicious and I like the flavours like cumin that you have added. btw, tried ur sringeri halwa, was a hit.. thanks!! 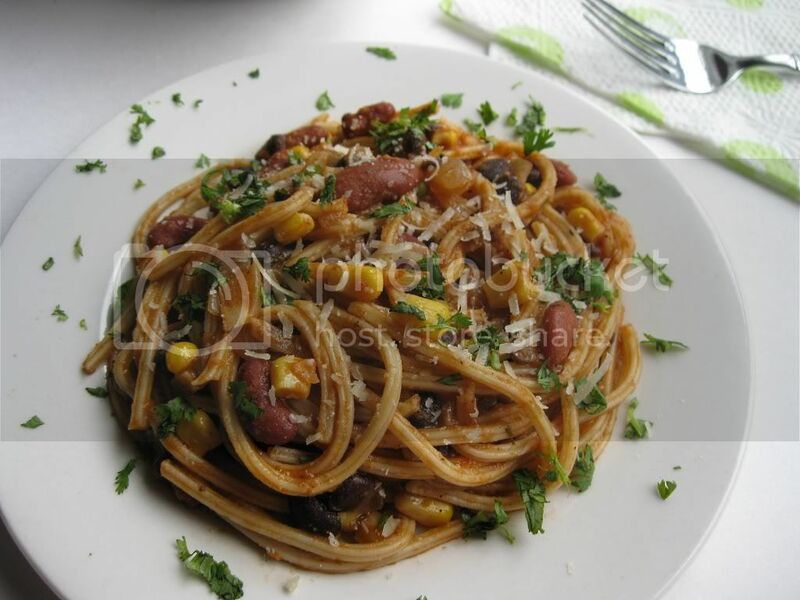 Pasta looks delicious n flavorful!